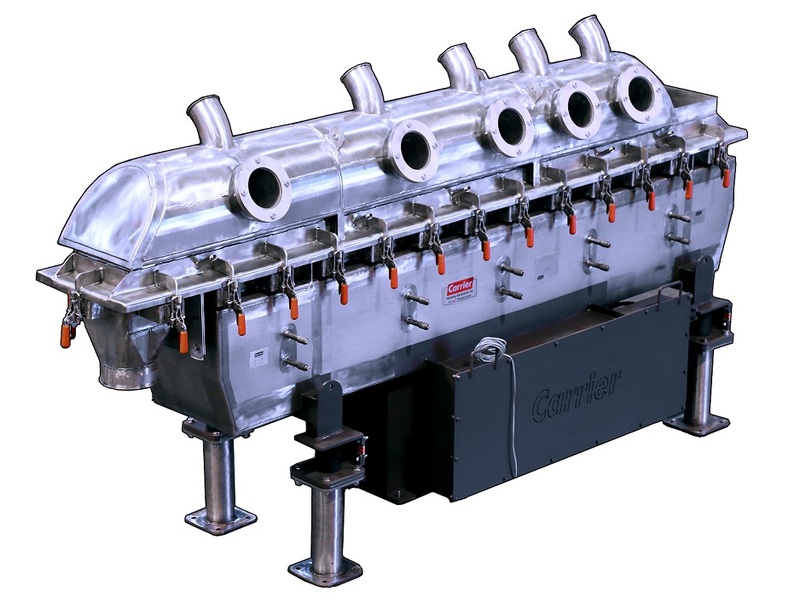 Carrier has developed a vibrating fluid bed for a drying process that required five distinct processing zones, four for drying product and one for cooling it. Each zone can be individually adjusted for airflow through the use of air balancing dampers, and independently controlled dual heaters provide two distinct overall drying temperatures. The fluid bed is equipped with Carrier’s patented Delta-Phase drive, allowing the operator to manually slow or stop the conveying in order to keep material in each specific zone for as long as needed. This allows the material to be dried from almost 30% moisture content down to less than 0.3% while being monitored and tested to ensure product quality. Viewing ports are incorporated into each zone to aid in the manual batch processing of material, and the fluid bed hood is designed to be clamped to the deck for easy removal and equipment cleaning and sterilization in between batches.